1. 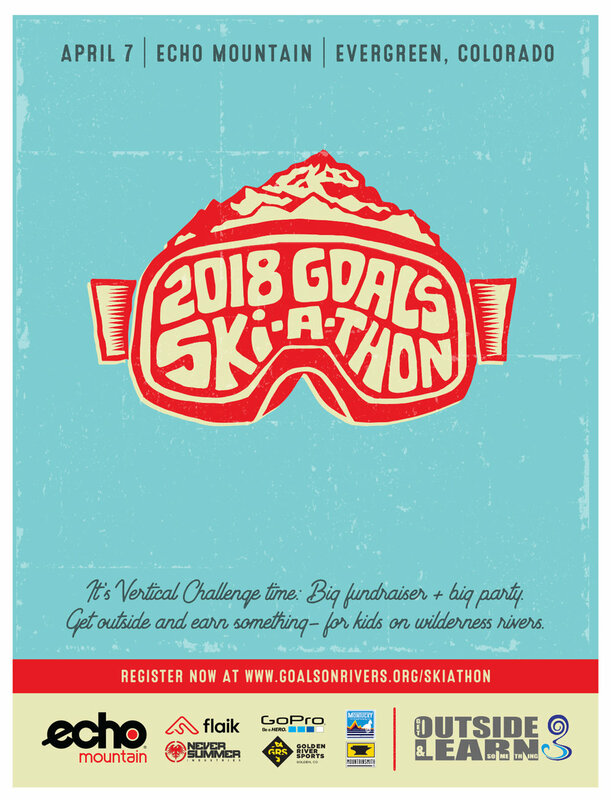 What is the goals ski-a-thon? It is a peer-to-peer fundraising campaign that raises money in support of GOALS wilderness river expeditions for kids. 2. IS IT ONLY FOR SKIERS AND SNOWBOARDERS? Absolutely not. Its for every single GOALS supporter on the planet If you support our mission, you should be on the team. 3. THEN...WHY IS IT A SKI-A-THON?? This event - now in its' 8th year - was designed to promote active, outdoor recreation during the season that we're not out on rivers. A great way to do that is through skiing/snowboarding, and thus in 2010 GOALS created the "Vertical Challenge" ski-a-thon, where supporters were challenged to ski/ride as many vertical feet as they possibly could, and sought pledges for their efforts. Over the years, we have learned that not everyone loves skiing 50,000+ vertical feet in a day - and the amount of money raised to support our programs is much more important than the amount of vertical feet skied. Therefore, the event has morphed into a fun, community-based 50-day fundraising campaign that culminates in a celebration party at our local ski area for anyone involved in the campaign who can make it. 4. WHAT HAPPENS AT THE CELEBRATION PARTY? The team of fundraisers get together and celebrate all they've accomplished. We mix river games and traditions with spring skiing (see the event schedule) and give away incredible prizes to our team. There are hourly swag give-aways, hundreds of celebratory high-fives, and more than your weekly quota of laughs. You'll leave feeling more connected to the GOALS community, and proud of what you've made possible for kids in our expeditions. 5. WHAT DOES THE MONEY RAISED SUPPORT? In 8 years of programming, GOALS has never prevented a child who wanted the experience but could not pay for it. Providing financial assistance at a level which keeps this streak alive is important to GOALS - and requires dedicated fundraising from a large support community. The ski-a-thon does more than any other event throughout our year to make this possible. 1. DONATE to an individual or fund raising team. Pick one you like at the bottom of the event page and make a secure, tax-deductible donation. 2. JOIN AS AN INDIVIDUAL. Create your page in just a few minutes. Create momentum by donating to it...then, send it to the world. 3. CAPTAIN A TEAM. If you have friends who support getting kids on rivers, build a team. They know people you don't - and can extend your reach of possible supporters way beyond your own social network. That's the beauty of peer-to-peer fundraising. Contact GOALS if you still have questions. Thank you for making a difference!